1. The Twitter network slowed to a crawl during Steve’s keynote. 2. The AT&T E network couldn’t penetrate Moscone South, the underground hall that’s the site of the main Expo, so you couldn’t keep up with Tweets using an AT&T mobile phone. 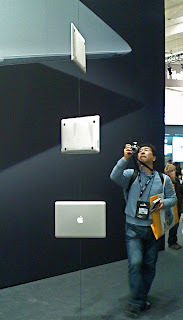 The wifi option was no help, as wifi networks in Moscone kept going down (including the one at the Bloggers Lounge). Nevertheless, I did manage to post my best Tweet ever, announcing that I’d just spotted Barak Obama getting out of a limo and entering the side door of the Westi Hotel at Union Square Thursday a bit after noon. It’s hard to believe that a year ago (even seven months ago!) there were no iPhones. They are pretty much standard fare around San Francisco now. I usually take a 12″ laptop to Macworld and lug it around, but this year I left the laptop in my hotel room and handled just about everything, including short emails, notes, photos for an article, and even some posts to a photo blog, using the iPhone. I left longer emails for when I got back to my room (again, a place with molasses-like wifi). My back certainly appreciated it…I was able to enjoy Macworld carrying just my regular messenger bag-style purse. My only regret was lack of zoom and flash for photos; next year I’ll take along a little Canon Digital Elph. Cameras of all sizes were much in evidence, with many people snapping photos of products instead of taking brochures. My strategy was to take a shot of an interesting product and then a shot of the booth’s signage, so I could identify the item by the adjacent signage shot after I’d uploaded the pictures to iPhoto. The other technology item that was ubiquitous in San Francisco this year was GPS. All the airport shuttle vans had it, and thank god. The driver from the Oakland airport acted as if he’d never ventured into downtown San Francisco before. My friend Doug Plummer recently rented a car with GPS while on a photo shoot in Boston, a city where the roadways usually confound him. “This time I had an authoritative female voice directing me,” Doug writes in his blog. I’ve just submitted an article about some noteworthy Macworld products; it’s scheduled for online publication later this week and I’ll be sure to link to it then.